Allows to connect more 1394a devices to your computer easily. Stable and reliable chipset JMB381. Compliant with IEEE 1394-1995, 1394a-2000 and OHCI 1.0 & 1.1 standard. Data transfer rate up to 400Mbps. Compliant with Single-Lane (x1) PCI-Express specification revision 1.0a. 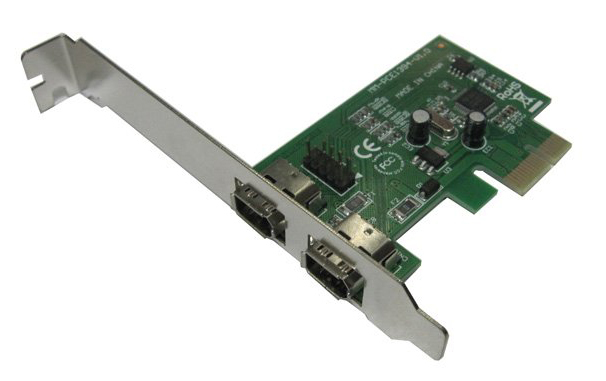 Supports 2.5Gbps PCI-E bus with full duplex channel. 2 external 6pin 1394a ports available. Compatible with Windows XP / Vista / 7. Support devices: DV camcorder, DV recorder, Digital Camera, Scanner and High speed 1394 External HDD etc.